Oct. 7 marks the 50th anniversary of the first day of classes, and Linda (Singer) Black ’71 was one of 1,948 students there to experience it. 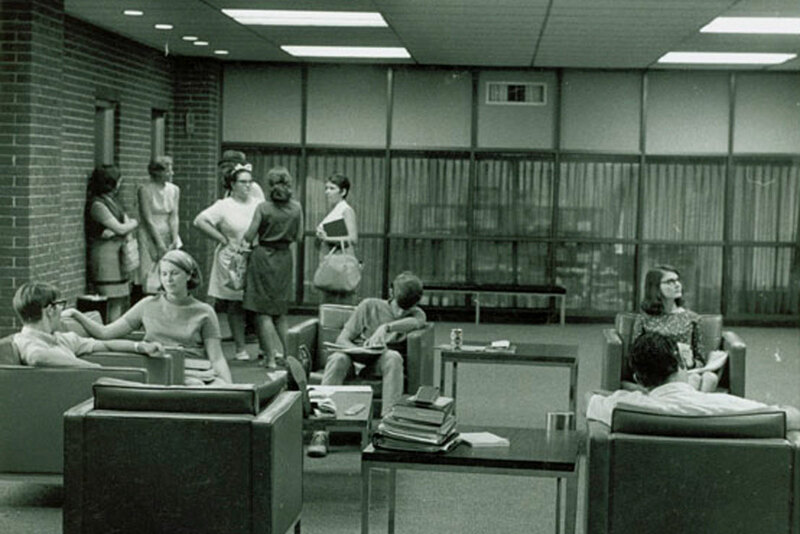 There were seven buildings, including the UCF (John C. Hitt) Library, when campus opened for classes on Oct. 7, 1968. On Oct. 7, 1968, Linda (Singer) Black ’71 stepped onto the campus of a brand-new university in East Orlando for her first day of classes. As the university celebrates its 50th anniversary of the first day of classes Sunday, Black takes us back to a time when students turned dreams into reality, parking could be challenging and innovation was embedded in the university’s DNA — maybe some things don’t really change. Why did you apply to FTU/UCF? Why be one of the first? Being one of the first wasn’t really in the forefront of my mind. I graduated from Winter Park High School and I heard there’s this new university opening in the fall and it was affordable. So I thought, I guess I’ll go there. I found out the office for UCF was downtown in this nondescript building. One day I went down there and I’m in the elevator to get my application and there was a man riding with me — a distinguished man with a pipe that he wasn’t smoking. He said, “Oh you’re interested in going to our university?” I said, “Yes I am,” and I introduced myself. He said, “I’m Charles Millican, and I’m the president. Come in, I’ll give you an application.” I applied, and it was approved within a couple days. What was the commute to school like? They were just finishing [State Road] 436 (Semoran Boulevard). There was nothing east of it because it was just all cows and farms. There was no University Boulevard. It was a dirt road, and I drove my Rambler down it, past all the heavy machinery as the construction guys were screaming at me. But I saved about an hour in trying to get to school. Otherwise, you’d have to go to Aloma Avenue to Oviedo and then down Alafaya Trail, which was two lanes at the time. Finding parking wasn’t an issue because there were hardly any buildings. Everything around the library was parking, and it was all sand, and that was a challenge in its own right. A lot of times you’d get stuck and you’d have to ask someone to help you push your car out. It was probably the only time in UCF’s history when finding parking wasn’t an issue. What did you think of the university’s culture then? How would you describe the attitudes of the students? It was all innovators. It was people who took a risk to come there. Anything you wanted to start, you were it. If you said, “Oh I think I’ll start an economics club.” Then OK, you’re it. “I think I’ll start a fraternity.” Oh OK, well, you’re it. Everything was innovative. Even to picking out the mascot and voting on Pegasus and the Knights. Whatever you wanted to do, you were free to do. It didn’t matter who you were before or what family you came from. 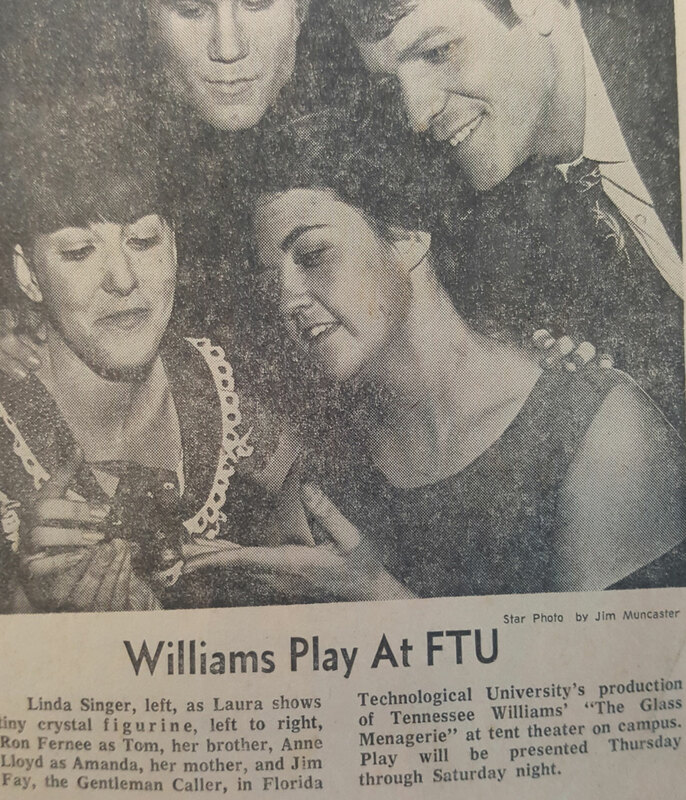 Linda Black was a part of the first theatre productions on campus. You could take as many hours as you wanted for $125, so I did. I usually carried 18 hours of classes. I just loved economics and finance and theater. But back then, the women’s liberation movement was just starting to take shape. You could be a nurse, you could be a teacher, an office assistant and those were kind of your choices, but I wanted to be a stockbroker. The College of Business wasn’t really excited about having women in it. I decided to go into education. But a couple years later, my sister-in-law was head of the Marketing Club at UCF. I had friends who went into medical and engineering. It seemed in just a couple years’ time, everything flew open and you could be whatever you wanted to be. When you step on campus now, what do you think? I was last there last year, but I worked at the library from 2003–05, and even working there for those two years freaked me out. When I walked into that library, I felt like I was 18 again, looking around and just dumbfounded. I remember going for walks at lunch every day and just taking a different circle. To see how it expanded, and the place is still growing. A medical school? The downtown campus? Seriously? What has your experience at UCF meant to you? When I was young, I was shy and didn’t think I was worth anything. I think UCF gave me the courage to do anything I wanted. And to just go for it. 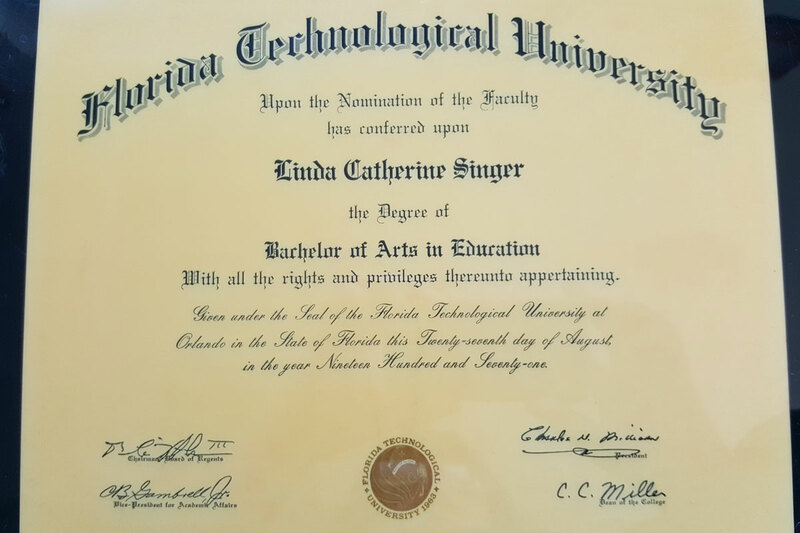 Graduates of FTU were given the option of turning in their original diploma for a UCF-branded one after the university changed its name, but Linda Black kept the one she received in 1971.